WTF? Instagram are selling my photos? Now we are part of Facebook, we are going to try to do those crap Facebook ads. You know the ones you all moaned about months ago, in which an advertiser who you liked can use your picture to tell your friends that you like their product. 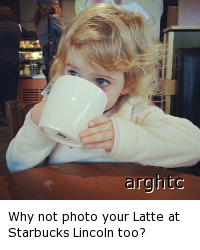 So to allow the local coffee shop which you tagged the photo of your latte, to try to get your friends to also take photos of their lattes, Instagram need to change a couple of the terms. Now in theory this also allows them to sell my photos for a huge billboard ad at every train station, but then the highest res photo stored on Instagram is 600×600 pixels. Not the greatest for print media. The biggest PR problem for Instagram is the failure to explain. People will leave, but like those who wandered off to app.net, without your friends all following, what’s the point of being part of something if it’s only you? So on Wednesday morning I was up at 6am, along with a large number of others trying to get their hands on one of the 10,000 Raspberry Pi which were currently finishing Quality Assurance in China. Unlike what had been answered several times, they weren’t to be sold directly and we now being offered by third party companies RS and Farnells. Straight away browser tabs were open to both sites. Searching for “Raspberry” on RS loaded a “Register your interest” page, with no sign to buy I filled in my details and hit enter. However I ended up on the same page I was just at. So I tried again, hit enter and nothing, server errors, so through out the morning I was hitting refresh. Finally it submitted, but again taking me back to where I began. If you’re only seeing “register an interest” on RS’s site, you’re on the wrong page. Maybe if I had an RS account I might find this magic purchasing page, so I tried to sign up. Again server errors all over the place, but eventually I managed it. Then typing “Raspberry” in to the search box, just took me back to the Register page. So one final time I entered my details and this time was taken to a Thank You page. This was two hours later and clearly put me back to the end of the queue. Whilst all this was going on, my luck with Farnells was even worse, pages just wouldn’t load at all, until they finally stuck up a “Maintenance” page. Then after 8am, it looked better, I could add a Raspberry Pi to a shopping basket, then the pages timed out as I tried to complete the order process. Finally at 8.24 I managed to complete the order. yay, finally got a pre-order sorted on Farnells for a @Raspberry_Pi, now the waiting game for delivery. Guessing at May. but a short while later I got an email with a delivery date of 26th March. Wow, that was fast, but the speed of the email still left me thinking May. Later in the day a second email arrived, this with a new delivery date of 26th April, a month later. As it’s not far off my expected date I wasn’t too upset. So the morning was long, but I got an order placed, my Pi will arrive one day and I’m happy. Some people however appear to be far from happy. They were disappointed that RS and Farnells websites couldn’t cope with the pressure (these are companies who sell electrical components, I doubt they have ever had a rush to their sites, and have any of these people tried to buy tickets to gigs before?). That shipping wasn’t available to their country (on the wrong country website). That they only heard it was on sale due to the news/twitter/facebook/friend, yet they were subscribed to the Announcement list (my email arrived the night before, but I had @raspberry_pi open in a tab on my phone for the last week and knew within an hour that 29th Feb 6am was the time, not only that but the blog and other sites had covered the annoucment. Relying on one email, which could end up in a spam folder is the worst way to be ahead of the game for a limited sales run). That @Raspberry_Pi wouldn’t answer their questions directly on twitter (they were getting around 100 @replies every minute). However I would say that comms were poor, it appears that Farnells and RS hadn’t made their plans clear to the Raspberry Pi team, and no one from either company appeared to be around at 6am to clear things up. What could have been done differently? I’m not sure, whenever there is limited supply and hyped demand it’s going to result in a lot of unhappy people. 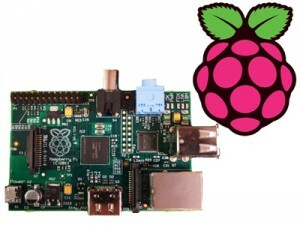 Maybe a lottery, one day to register your interest, then the next day email people, one a minute for a week, with a unique code to purchase one Raspberry Pi. This way the demand on the order day can be spread stopping people rushing at 6am DDOSing sites (although I’m sure they would still try), the emails would be manageable, avoiding most spam rules, and people clicking through to purchase wouldn’t reach a broken website. However you still end up with a large number of unhappy people who didn’t get one. But unlike tickets for the come back gig of Steps, more Raspberry Pi’s will be made, and the reason for using Farnells and RS is that they can now start making them to order, meaning there is no “second batch”, just lots more rolling of the production line. Cheap Video Playing Android Device? At some point I want to get my soon to be 2, daughter her own touch screen device. She often “borrows” my Samsung Galaxy SII or Heathers iPhone 4, and they are rather valuable. Play most video formats (MP4, DIVX) without a struggle, nor need for me to convert them first. So far this leaves either an iPod Touch or one of the Samsung Galaxy S Wifi 5 / 3.6 models, all under £200 but not as close to the £100 mark I would prefer. Now I’d rather have an Android device, but willing to accept that at the moment the iPod might just have the advantage, however I was wondering if I’ve missed anything else on the market, or you know of a cheap phone in which you can completely disable the phone part (even if it requires rooting and hacking) as I don’t want her calling anyone including 999 (which by law should be possible on any phone, even when flight mode is enabled and has no SIM card)? Let me know in the comments if you’ve got any ideas. 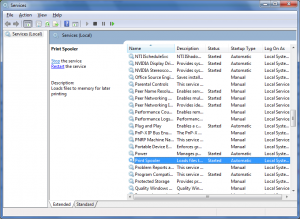 Print job stuck in Windows 7? Having finally installed iOS4.1 on Heathers phone, I managed to get the AirPrint installed (hacked) on to my Windows 7 machine. Several test prints worked fine, but then when Heather gave it a go nothing came out. Looking at the print queue I could see the incomplete job “printing”, but attempt to cancel or delete did nothing. With this item at the top nothing else would print. Turning the printer off for a few minutes did nothing, nor did rebooting the PC. 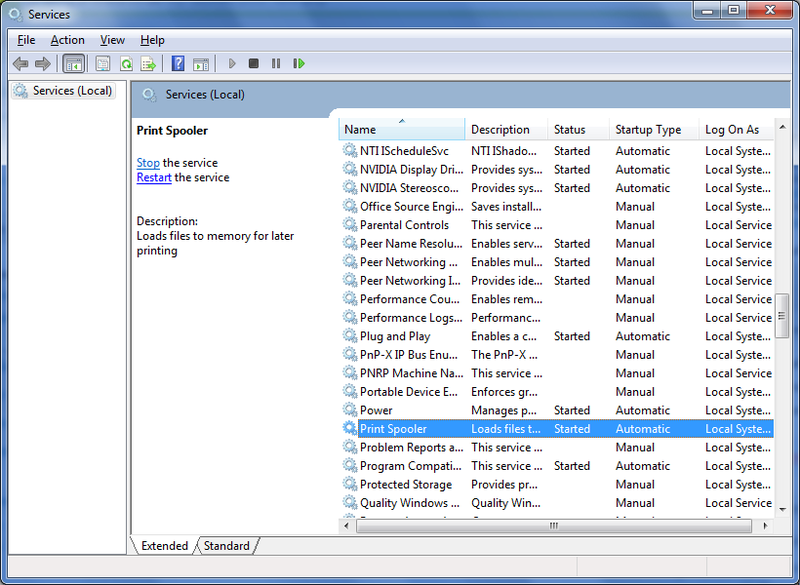 In Control Panel open “Administrative Tools” (might be in “System and Maintenance”). From here double click on “Services”. Scroll down until you see “Print Spooler”, right click and select “Restart”. Wait a minute or two and your print queue should now have finally deleted the job. Looks like Itezy have changed their name / using another one, however the scam is still the same as I exposed a couple of months ago. They call saying they are offering free support. Take control of your computer, then state it is infected and charge you through the nose to get the “viruses” removed. Keep well clear of them. Thanks to John Ingle in the last post for the tip-off. ps, looks like they are comment spamming over the internet trying to boost up their page rankings / dropping the negative articles. If you run a website where they have left their crap I suggest either a) deleting it, or b) let your reader know what a bunch of scum bags these people are. I’ve just had a phone call from Mike Cooper at “Microsoft” claiming that they will provide me with free IT support. He advised me that I was being called because when Internet Explorer crashed and I pressed Report this to Microsoft the problem was so important they phoned me and that the problem on my computer had actually infected Microsoft’s own servers! Not only would he help fix my computer but he would provide free software to keep it protected in the future as no one anti virus software would protect me “100 person”. All I had to do was visit itezy.net and download “System Protector”, “Email and Data Backup” and “Anti-mallware Protection” and if I had any future problems to call them back on 0800 0988470. As soon as the call started I knew it was a scam, for starters Mike didn’t sound very English, he was badly reading from a script, he wanted me to visit Microsoft’s website at a URL which wasn’t microsoft.com, and he thought I was still using IE! I ended the call at the stage where he wanted me to enter their website, this allowed me to get most of the information they were providing to write this blog post without infecting my machine. I was then phoned back twice, however I just ignored the calls. Microsoft will never call you, if you have visited this website uninstall anything you have downloaded. If you have handed over cash ask for your money back and contact your credit card company. Get a real anti virus software and check to see if anything has been left on your machine, and if you are still worried take it to a local expect. Microsoft Australia have a blog post about this scam, looks like it’s just started to come over here. 8th June 2010 edit: for a laugh I went to their website on a sandboxed device. They list their “UK address” as Marble Arch Tower, 55 Bryanston Street, London, W1H 7AA which when googled comes back with a variety of iffy companies and this one for a Virtual Office where you can have your mail redirected. And looking further the same goes for their New Zealand, US and Australian offices. Ever since I started watching DIVX / XVID versions of my favourite TV shows from the States I’ve always wanted to run them through my TV, instead of watching them on my PC. Media Centre PC’s have been available for some time, plus streaming set-top boxes that read the files from over the Wifi. However these require extra money. I had noticed that my DVD player would play DIVX files from disc, however only from a CD and not a DVD which meant only 2 episodes per disc, and I had no choice over which one it picked first. However today I’ve installed some stuff on my Wii which allows me to watch files from either a USB stick in the back, or on the SD card. The software also makes it possible to stream files over Wifi, however at the moment it’s just running a bit too slow, and it doesn’t have a browser for this option, all files names need to be hard written into a config file. Now once you have the above, visit this site to download all the Wii Homebrew Software. You may have noticed some emulators, I’m not talking about those here, but feel free to tick the boxes to download them as well. Once you’ve ticked all the boxes you want, hit the Create my custom pack button. You will now have a ZIP file on your PC. You will need to extract this to the ROOT of your SD card. Now pop Zelda and the SD card into your Wii. If you have never played Zelda on this Wii, start it up, and exit as soon as possible. Have a watch of this video to see how you install the HomeBrew channel on to your Wii. Once installed you no longer need Zelda, so put it back on the shelf or return it to whoever was kind enough to lend it to you. Now open up the HomeBrew channel, run the MPlayerWii app and you should be able to select the SD Card or the USB Stick.